Level: Moderately Easy for adults. Requires ability to cut and glue patterns. Got a Hoodie — Make a Costume — Back to Hoodie! Measure around outside edge of hood. Cut VELCRO® Brand Clear tape to length. Apply loop side to outside edge of hood. On hook side, partially remove tape backing. Leaving a 3 inch tail, stick yarn to end of tape. Make 3 inch loops from yarn and stick to tape. Continue to loop back and forth until entire tape is filled with yarn, up to the tape backing, 3inches from the end. Attach to outside of hood for mane. Cut 1 inch x 12 inch strip from yellow felt. Tail Tassel: Cut eight to ten six inch pieces of yarn. Lie side by side and tie at center with another 6 inch piece; fold over at tie. Cut 15 inch piece of yarn. Leaving a 3 inch tail, wrap around top of tassel several times and tie ends to secure. Use craft glue to secure tassel to end of tail. Cut 1 inch of clear tape. Apply hook side to back of tail. Apply loop side to center back of hoodie at bottom edge. Attach tail to hoodie. Print out pdf patterns. Cut out paws from yellow felt and claws from white felt. [Tip: Use disappearing ink marking pen for transferring patterns.] Glue claws to toes on paws. Cut 1/2 inch of VELCRO® Brand Clear tape. Apply hook tape to top of one side of paw strap and loop tape to underside of other strap. Cut slits in top of paws and loop shoestrings or shoe strap through slits to keep paws in place. 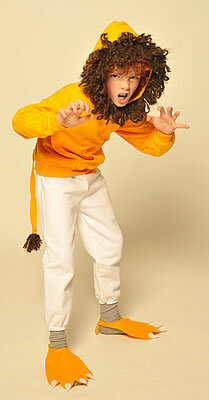 After wearing, remove mane, tail, and VELCRO® Brand Clear tape to return hoodie to original condition.